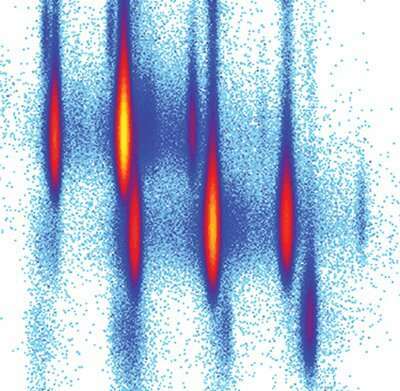 Now, an international team led by scientists at the Department of Energy's Lawrence Berkeley National Laboratory (Berkeley Lab) has reproduced this exotic system, known as magnesium-40, and gleaned new and surprising clues about its nuclear structure. "Magnesium-40 sits at an intersection where there are a lot of questions about what it really looks like," said Heather Crawford, a staff scientist in the Nuclear Science Division at Berkeley Lab and lead author of this study, published online Feb. 7 in the Physical Review Letters journal. "It's an extremely exotic species." While the number of protons (which have a positive electric charge) in its atomic nucleus defines an element's atomic number—where it sits on the periodic table—the number of neutrons (which have no electric charge) can differ. The most common and stable type of magnesium atom found in nature has 12 protons, 12 neutrons, and 12 electrons (which have a negative charge). Atoms of the same element with different neutron counts are known as isotopes. The magnesium-40 (Mg-40) isotope that the researchers studied has 28 neutrons, which may be the maximum for magnesium atoms. For a given element, the maximum number of neutrons in a nucleus is referred to as the "neutron drip line—if you try to add another neutron when it is already at capacity, the extra neutron will immediately "drip" out of the nucleus. "It's extremely neutron-rich," Crawford said. "It's not known if Mg-40 is at the drip line, but it's surely very close. This is one of the heaviest isotopes that you can currently reach experimentally near the drip line." "The interesting question in our minds all along, when you get so close to the drip line, is: 'Does the way that the neutrons and protons arrange themselves change?'" said Paul Fallon, a senior scientist in Berkeley Lab's Nuclear Science Division and a co-author of the study. "One of the major goals of the nuclear physics field is to understand the structure from the nucleus of an element all the way to the drip line." The study is based on experiments at Japan's Radioactive Isotope Beam Factory (RIBF), which is located at the RIKEN Nishina Center for Accelerator-Based Science in Wako, Japan. Researchers combined the power of three cyclotrons—a type of particle accelerator first developed by Berkeley Lab founder Ernest Lawrence in 1931—to produce very-high-energy particle beams traveling at about 60 percent of the speed of light. "Most models said that Mg-40 should look very similar to the lighter isotopes," Crawford said. "But it didn't. When we see something that looks very different, then the challenge is for new theories to capture all of this." "We speculate on some of the physics, but this has to be confirmed by more detailed calculations," he said.